It would be an understatement to describe Anne Martin, aka Mossin’ Annie, as passionate about moss. In fact, if you want to learn just about anything related to those soft green masses underfoot, ask Annie. Among the things you’ll quickly find out is that Martin admittedly isn’t a formally trained bryologist, but is a self-proclaimed “pure old moss lover,” who finds in each one a magical, miniature world. She attributes her affection for mosses to a childhood spent in Asheville that included frequent camping trips and playing in her grandmother’s yard in the Kenilworth neighborhood. 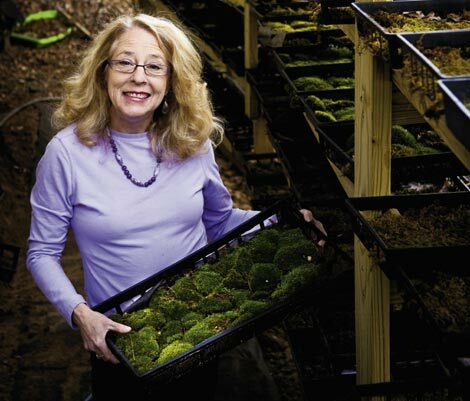 She recalls making terrariums in elementary school, and how that interest grew and evolved into her business, Mountain Moss Enterprises, which specializes in the design and installation of eco-friendly moss gardens and sustainable landscapes. Here in the mountains, Martin has a wealth of material with which to work. Roughly 450 types of mosses thrive in Western North Carolina, a respectable representation of a species that dates back more than 450 million years. Bryophytes, Martin loves to point out, were in place 50 million years before any other plant, paving the way for other vegetation. Yet mosses are often overlooked, going unrecognized and unlabeled even in botanical gardens. And Martin finds it downright insulting that there isn’t a comprehensive field guide for bryophytes. She is determined to raise their profile by educating others on the distinct features that make mosses exceptional. They have no roots, but rather filaments that anchor them to virtually any surface. Their leaves are not coated, enabling mosses to absorb water and nutrients through their entire surfaces. They don’t produce flowers or seeds, which means mosses are in a constant state of reproduction through spores. Even fragments can quickly become new plants. Proven survivors, bryophytes manage in nutrient-poor conditions, from acidic forest floors to concrete driveways. Mosses also tend to be resistant to extreme temperatures, producing an acid that acts like antifreeze and allows them to flourish even beneath snow and ice. Martin has developed her knowledge over the last dozen years, and has come to the realization that she was born a “moss artist.” “I came to look at the land as my canvas and realized that my paints are the mosses—the textures, shapes, shades of green,” Martin explains. Her insight combines self-attained scientific knowledge and curiosity. Over the years, she’s observed mosses in their natural state and introduced them into new landscapes to document growth patterns and uncover their horticultural uses. Her experiments confirmed her assumptions that not all mosses thrive only in shade as commonly believed; she found that some types tolerate partial sun and even like direct light. She now adamantly believes the key to keeping them healthy is proper moisture. The increasing public interest in sustainability, Martin contends, may be the catalyst that finally boosts understanding and broad-based use of her beloved bryophytes. So far, she sees many key audiences, such as environmental advocates, developers, land planners, and landscape architects, slowly gaining awareness of the plants’ eco-attributes and versatility. Mosses are showing up more frequently in living roofs and urban greening projects, and are finding respect in land reclamation and erosion control efforts. Homeowners and landscapers can also use mosses as an alternative to mulch, since bryophytes allow water to soak through to the soil and provide a nurturing, lush green base instead of a drab brown layer that needs regular replenishment. Imagine also a moss lawn that needs no chemicals or pesticides to flourish, requires a fraction of the water used for grass, never needs mowing, and is green year-round. Martin asserts that mosses could one day become a local cash crop like the turf grasses grown commercially in huge fields near her home in Pisgah Falls. Martin reluctantly thinks of herself as a pioneer and an expert, but only after believing she’s done enough research and produced practical examples of sustainability. Star moss (Atrichum angustatum): Thrives in sun or shade, and is a good choice between patio stones. Plants are bright green with burgundy sporophytes that reach two inches in height. Tree moss (Climacium americanum kindbergii): Another shade/sun option that’s an ideal water filtration choice for runoff areas. It’s large with tops resembling little trees, and it may transition to yellow-green shades when mature or during drought.